The Karnataka Premier League (KPL) is currently in progress and seven teams are fighting it out for the ultimate glory. With the tournament going deep, there is a close tussle to make it to the knockouts. On Saturday, Belagavi Panthers and Bellary Tuskers square off in Mysore and the former side won the game easily. However, their skipper Stuart Binny hogged the limelight for a sensational catch which he grabbed in the penultimate over of the encounter. After being invited to bat first, the Panthers posted a decent total of 157 runs for the loss of seven wickets in 20 overs thanks to some lower order resurgence. M Nidhish and Prashanth S added some crucial runs at the death overs and propelled the score. The chase was going to be tough but not impossible for the Tuskers. But after a decent start, they kept on losing wickets at regular intervals and made it difficult for themselves. The game was turning out to be one-sided and tame as none of the batsmen looked to spend their time in the middle and it was Tuskers’ lower order batsmen who were looking to play 20 overs of their quota. Amidst the grim proceedings, there came a moment which woke everyone up. In the 19th over of the innings, Pradeep T smashed the length ball delivered by Avinash D to deep mid-wicket. It was such a powerful hit that the ball was destined to go over to ropes. 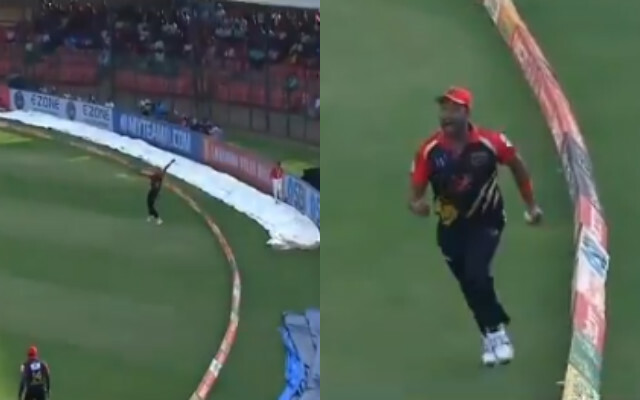 But Stuart Binny had other ideas as he chased the ball while it was in the air and then timed his jump perfectly to grab a one-handed stunner. He kept himself inside the boundary and the celebrations began in the Panthers’ camp. They won the game eventually by 23 runs as Bellary Tuskers were bundled out for 135 runs in the same over. It was also their first victory in three matches with their opponents succumbing to the fourth loss in five encounters.